A slideshow of Los Angeles at its magic hours where the sun and moon are making it over. By the second shot you realise there's something odd here. All the iconic areas and the skyline are in the background with construction sites and work yards in centre frame. This is the metropolis as seen by a jobhunter. Not a Hollywood hopeful just someone who needs a living. We meet Lou Bloom from behind as he cuts through an industrial fence. As we're soon to learn, he's not on a graffiti mission or up for sabotage, he's cutting the fence wire to resell it. A sudden act of violence later and we see that not only will he act extremely for gain the disconnection between him and his conscience is unsettling. In the next scene he loses a bargain to sell his obviously stolen goods and doesn't baulk when called out on his crime. Baulk? He salutes his accuser with a grin. There is something wrong with the grin; it's falseness seems to vacuum up all the charm it might have shared. In fact, whenever Lou rounds off a platitude with a laugh the void that opens gapes with a vertiginous horror. Chancing on a car crash he watches in fascination as a news stringer rolls up in a van and lunges into the action. His wide headlight eyes absorbing a kind of salvage that will be in endless supply. It excites him. Not in the way that an opportunity for advancement through violence excites an Iago or MacBeth but in the way any living thing is excited by food. Step by step, Lou sets about equipping himself for this hunting and gathering until his content wins ratings on the morning news and the stringer from before considers him a rival. How far will he go? You can guess. You'll be right when you guess but you won't be moaning about predictability. This film is not about the plot (though it is pacey and waste free with its narrative muscle) it's about Lou and the world that absorbs him like nutrients. Lou reveals things to people that might normally engender winces or the reclamation of personal space. He says he learns a lot from the internet and that he spends a lot of time on his computer. He repeats hokey self-help MBA wisdom in a voice out of a youtube promo so devoid of irony that you are certain that he gets away with it because everyone assumes he is being ironic. He also mixes it in with bits that sound more spontaneous which serves to muddle the mix. One rung above the Hollywood version of autism, he gets through the barriers of the media organisation he infiltrates by being like one of its products. One short scene is telling. He is at some mundane household task as Danny Kaye's Court Jester plays on tv. Danny seems to get his head cut off but seconds later it emerges cartoonishly from the armour. Lou takes a moment then grins widely and laughs his big vacuous guffaw. Instantly, we know that he has studied this reaction. Whatever real mirth he feels is supplemented by how the successful people he has witnessed behave. All those grins and ironic giggles are perfomance and the flat naivete rolling out below them is the real Lou. He just knows how he's meant to come across. There are moments when this training fails him and he can't quite connect (the restaurant scene in extraordinary here) and, recognising this, he falls into plainer aggression. It's as though he's the kind of goofy alien or robot that used to figure in 60s tv comedies like Get Smart dropped into contemporary Los Angeles but with real bloody organs inside. This is astute writing but would not work for a moment without right casting. Jake Gyllenhaal, who came into our collective consciousness as the extremely and believably troubled Donnie Darko has found another role worthy of his strange subtlety. He allowed the crazy dialogue he had as Donnie to sound exactly like a teenager who thought too much and whose diagnosis made sense (a psychiatrist friend told me that that movie was one of the most accurate depictions of schizophrenia he'd ever seen in fiction). Gyllenhaal has gone through many roles in the near one and half decades since but here it feels as though he has touched base with the good stuff and pulled out something that allows us access to this otherwise impossible character. A late scene with his rival stringer involves Lou calmly detailing the violence he feels like doing to the other man but that he has better things to do. The moment is both funny for its deadpan rage and chilling for its sincerity. Oddly, I was often wondering what his stark dialogue felt like to read on the page. Because of the character's constant and severe calculation this thought never felt like it was taking me out of the movie. 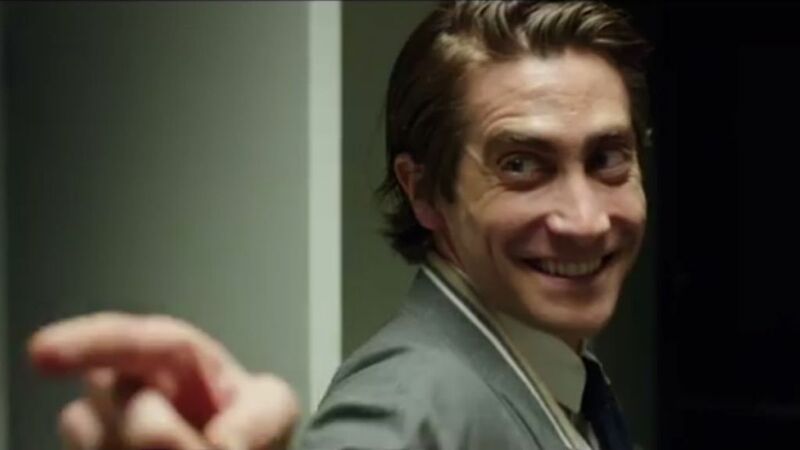 Gyllenhaal owns Lou the same way Dennis Hopper owned Frank in Blue Velvet and the result steals our breath. You could call this a satire on the media but you don't have to; the surface plays with such constant assault that none of the cards need concealment. It's not so much Network as Under the Skin, less Othello than The Selfish Gene. It's the better for all that.